Luo Delong (left) and Jiangan Li shaking hands after the signing ceremony in Beijing. The Chinese Domestic Agency, established on 16 October 2008, has awarded its first contract to the Institute of Plasma Physics (ASIPP), located in Hefei. The contract covers the manufacture of one 765-metre long Cu dummy and one 100-metre long Nb3Sn cable-in-conduit conductor for the ITER toroidal field coils. These two lengths are part of the process qualification phase of the Toroidal Field Conductor Procurement Arrangement and will be produced on the 900-metre-long jacketing line presently under commissioning at ASIPP. The contract was signed in Beijing on 23 October 2009 by Luo Delong, head of the Chinese Domestic Agency, and Jiangan Li, director of ASIPP. 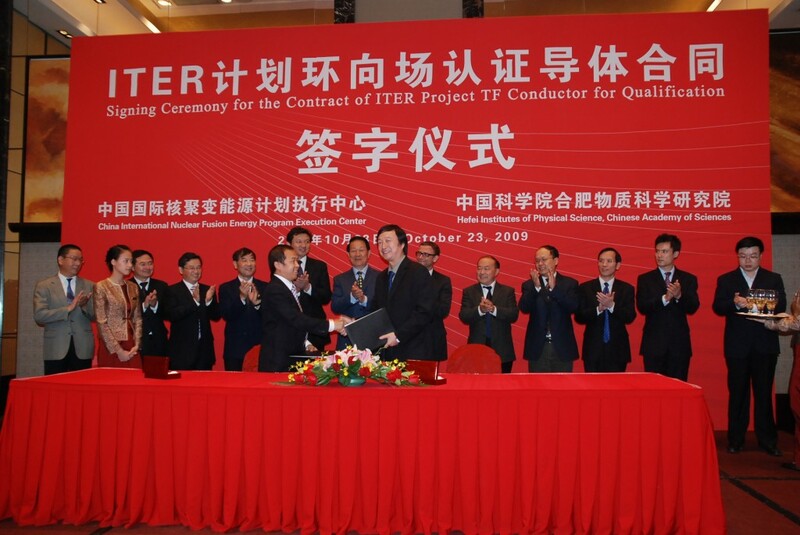 "This contract is a significant milestone that demonstrates the strong commitment of China in building its share of ITER," said Luo Delong.